One of the best ways of monetizing your blog or website today that is yielding positive results is affiliate marketing. It is one of the most effective tools or channels used in internet marketing and it is a great money making opportunity for both the merchant (a buyer and seller of commodities for profit) and the blog or website owner. According to Wikipedia, “Affiliate marketing is a type of performance-based marketing in which a business rewards one or more affiliates for each visitor or customer brought by the affiliate's own marketing efforts”. Simply put, it is the type of marketing where one party advertises another party’s products and service and makes a commission when the products are viewed or sold. The working of this type of marketing is pretty simple and is easy to incorporate in an existing business or a new one. An advertiser comes up with an advertisement, he/she sends this advert to an affiliate marketer who the places the same on his blog or website. A person visiting that blog sees the advert and the marketer get a fee for it which is pre-negotiated. That gives the blogger with little efforts right? check out benefits of blogging. 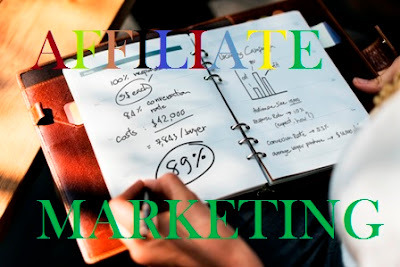 The working principle of affiliate marketing is pretty straightforward and is summarized in the steps below. · They click on the advert and either makes a purchase, sign up on a website, complete a survey, etc depending on the nature of the advert. · The blogger or website owner gets paid a fee. Note: Some merchants only pay when a visitor buys from them, some when a visitor clicks on their advert (cost per click or CPC) while some pay for the number of views their advert get i.e number of people that are redirected to their site from your site. Some advertisers pay for a combination of all the three above while the most common is the payment made to the blogger after a purchase has been made. Also, companies like google tries to place content related adverts (i.e adverts related to content of a page) on pages so you should choose a blogging niche (what to blog about) and write articles which people relate to more but in no way compromising quality of posts. 1. It is a fast way of making money: Provided you have the right website popularity and the right audience, affiliate marketing can make you some serious cash in a short time. 2. You don’t have to manufacture goods by yourself: What many bloggers and site owners like is that, when they are into affiliate advertising, they don’t have to create any service or product by themselves. That responsibility is that of the merchant to produce the services and products. This means that you only need to choose from the service or products that provide good commission to sell. Because you are not required to do anything in terms of service delivery, or production of products as an affiliate marketer, you can solely focus on advertising the service or product. 3. Little or no startup Capital is required: This is one of the best features of online marketing to a blogger. This is what I call “spend less and get more”. This essential characteristic which makes it easy to start a blog or own a website for absolutely free means you can become an affiliate marketer and make money from your blog without spending a dime to start it up. 4. Little or no Risk involved: Because you are not producing any products by yourself, you don’t have to worry about production any products overstaying on the shelf and other logistics involved in production. 5. It is a convenient way of making money: All you have to do as an affiliate marketer if insert a piece of code or a URL on your website. Products production, handling money transaction and delivery of products are all handled by the merchant and you have no business with that. All you have to do is insert a code and make money when a product is purchased using a link that came from your website. 6. You May get Quality Backlinks: When you are advertising for a website that has a high domain authority, you are at an advantage of getting backlinks from them which is a good way to boost your SEO. You can write specialized articles about their products and link to their website. They will in turn link back to you which may spell success in your struggle to get backlinks to your website to increase your search visibility and bring tons of organic traffic to your website. 1. Increased Income: when you are doing business with websites with the right visitors (visitors that are interested in your products), you stand a high chance of increasing your income from what you already have. 2. International recognition: your products should not be meant for only the people in your immediate vicinity alone take your business online and give your business the popularity it deserves. 3. Reduced advertisement fees: with this type of marketing, you only pay your advertiser based on the sales made from their site referrals instead of paying for adverts which may or may not bring desired customers. 4. No need to handle cash: Electrronic payment methods may be utilized to ease the payment problems since your business will no longer be a local business. This reduces the risk of been deprived of your earnings by people who think they need it more than you do. 5. You only pay when a transaction has been completed: this is what gets merchants excited. You are under no obligation to pay your advertiser anything until a specified transaction which may be a click, account opening or a purchase has been made or completed. To cap it all up, these payments are normally made once in a month and a minimum payment threshold is normally applied. This means that your advertiser will have to work hard if he/she wants to get paid every month. The most common question in this type of internet marketing is why should I use affiliate marketing? Taking into account what other marketing stratergies has brought to businesses, I’ll give you my answer as follows. Unlike adverts that you place in newspapers, radio stations or TV stations where you pay upfront a huge amount of money with no guarantee of generating sales from it, this is the best form of marketing. No sales, No payment to the advertiser.